Chef in Transition: I AM CANADIAN! 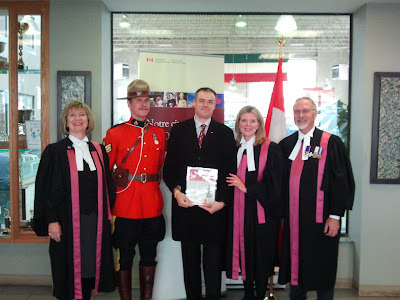 Today I became a Canadian citizen. Obviously a great day! Good enough of an excuse to not go to work, but not good enough an excuse to bail on the planned workouts. As this is a recovery week, this was not too much of a problem. I went to the Y for a short and easy weight training session shortly after 7:00 AM. This is kinda late for a normal day and so I was not too surprised that my training buddy Gen was not there anymore. Just as I got started I see her coming in tho. Strangely not in gym attire... well, she was done already. 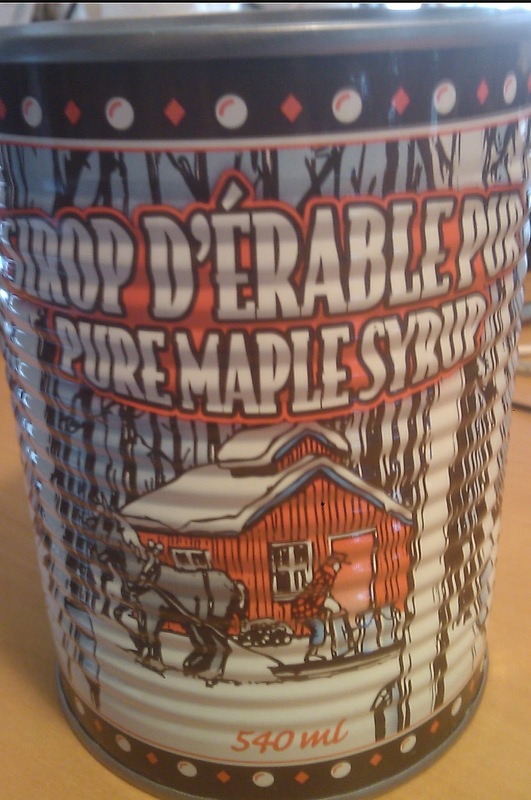 Gen just came back upstairs to give me a can of Pure Maple Syrup from her home town in Quebec. OMG YUM! Thanks Gen! 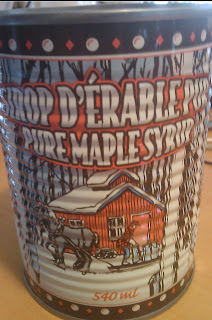 I am so going to enjoy this. Of course I Rrrolled up the Rrrim to Win but, alas, was not a winner. Oh well, in my books I am a winner today either way I slice it. Quick shower and before I could head out I had a quick call from Garmin regarding my last blog post. I'll update that later but it is super good news! Off I was to the Italian Cultural Centre where the Citizenship Ceremony was held. I got there about 15 minutes before my scheduled 10:30 AM appointment. There were 400 people in this ceremony alone! And they are holding 6 ceremonies over two days. After today we have 2,400 new Canadians from this region alone. I affirm that I will be faithful and bear true allegiance to Her Majesty Queen Elizabeth II, Queen of Canada, Her Heirs and Successors, and that I will faithfully observe the laws of Canada and fulfill my duties as a Canadian citizen. J'affirme solennellement que je serai fidèle et porterai sincère allégeance à Sa Majesté la Reine Elizabeth Deux, Reine du Canada, à ses héritiers et successeurs, que j’observerai fidèlement les lois du Canada et que je remplirai loyalement mes obligations de citoyen canadien. We are now officially Canadians! Row-by-row comes up and gets their Citizenship Certificate and Citizenship Card from a judge. Then it was time for lunch and so went to a little Quebec diner near our place and had a smoked meat sandwich and poutine. I still have some training to do: 1 hour easy spinning on the trainer. 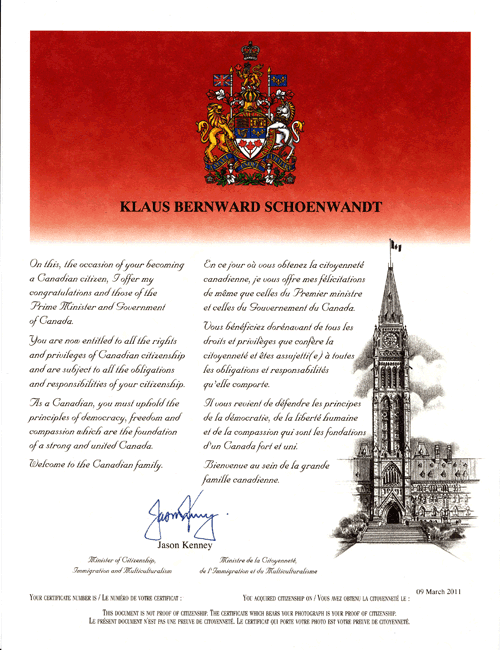 I stumbled on your blog while looking for a sample image of the Commemorative Citizenship Certificate. I wonder, during your ceremony, did anyone invite you to apply for a Cultural Access Pass? It's only for new Canadians and entitles you to free museum admission... here's the link: http://www.icc-icc.ca/en/cap/institutions.php. Email us at cap@icc-icc.ca and let me know. Very best wishes and congratulations!